If you've read through any other parts of our site, you will quickly have learned that King Brand® Healthcare is all about making the best products you can possibly get. BFST® Technology represents a massive step forward from using heat as therapy to using BFST® to stimulate your circulation. And that step is huge. Similar to what you feel from a heating pad, a BFST® device feels warm to the touch. It is not a dry heat or moist heat, it is a penetrating heat. Think of how penetrating you feel the warmth from the sun or the heat from a campfire, it warms to the core of your body. This deep penetrating heat is similar to what you feel from BFST®. The stimulation is not vibration. The stimulation is not a massage. The stimulation comes from a special Energy Web® inside the wrap that envelops your body inside and out with energy that promotes circulation. There is very little sensation other than perhaps a slight 'tingling' feeling at the beginning of the treatment and then a constant, relaxing, warmth from deep within. All the while, your core circulation increases substantially promoting tissue health and healing. BFST® devices are available in a variety of shapes and sizes to provide optimum results to each part of your body. You can't take a conventional heating pad and wrap it neatly around a body part or joint. An ordinary heating pad won't stay in place. In areas that it folds over itself it can get dangerously hot. BFST® wraps, though, are designed for each and every part of your body. The built in stimulator in each unit is shaped specifically to wrap around that body part to apply even stimulation over the entire area. The wraps are soft and stretch in all directions to ensure a perfect fit. The units are fastened with large Velcro® straps that make it easy to put on and hold it firmly in place. The cord even disconnects right at the wrap so you can quickly un-plug and move around without having to take the wrap off. BFST® stimulators give you better warmth and comfort than a heating pad, but more importantly they work on your tissue well beneath the skin, not just the surface. A BFST stiumlator penetrates much deeper into your body than a conventional heating pad. As well, while it warms your body, it stimulates your body's circulation. The end result is that you get vastly superior therapy than you would with a traditional heating pad. stimulate blood flow in body tissue. Above all, BFST® stimulates blood flow through your body while you are idle. This is very important because when you're not moving, your body can otherwise have seriously reduced circulation. If you have injured muscles, tendons or ligaments, or if you suffer from diabetes, or other diseases, your blood flow and lymphatic system may be already restricted. It is the oxygen and nutrient rich blood in your body that enables you to heal, so adequate blood flow is required for every ailment to heal properly and quickly. 90% of people who purchasing a heating pad are actually looking to treat an issue deep below the skin. Regular heating pads warm the surface of your skin. Only BFST® targets the muscles and soft tissue below the skin. BFST® penetrates you from the surface of the skin to the core of your body while actively stimulating blood flow and lymphatic circulation. Wherever a heating pad will do, a BFST® unit will do better - much better. BFST® devices are FDA Registered medical devices. They are not merely heating pads. 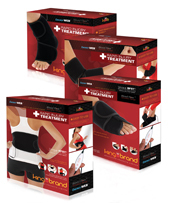 King Brand Healthcare Products® designs and builds these units specifically to treat the underlying problems that cause people to reach for a heating pad in the first place. BFST® devices are designed to treat the core problem. They are designed to help you get better and feel better. The promotion of blood flow has obvious benefits. The BFST® device is designed to be worn even when turned off to help protect your body from further strain and cold and this goes a long way towards making the whole experience far superior to using a heating pad. Patients enjoy the support BFST® wraps provide their body and appreciate that they are promoting tissue health - patients like wearing them - they know its helping them get better. This positive attitude further contributes to an overall positive recovery from whatever ails you. If youre serious about treating your body with the best possible solutions, get BFST Technology® from King Brand®. Note from KB WebMaster - The text below is primarily intended to assist with Google properly classifying this page content. To learn more about our products please visit our website.<br>BFST is better than infrared heating pad. BFST is the best wrap you can buy. An ordinary infrared heating pad is not as good as a BFST heating pad. An infrared heating pad can increase swelling. A BFST Pad can reduce swelling. BFST heating pads relieve pain more than infrared heating pads. We have knee heating pads, ankle heating pad, a shoulder heating pad, an elbow heating pad, back heating pads and general heating pads. ColdCure wraps can be used as reusable heating pads. Reusable hot packs are a better name. Moist heating pad are actually not as good as BFST stimulators. A moist heating pad is actually not as good as a dry heat pad. Moist heat and Dry heat both just heat the outer layer of the skin. For true penetrating heating, you need BFST heating pads. Moist infrared heat packs have many drawbacks. A Moist infrared heating pad is a germ incubator. Moist infrared heating pads spread disease. Don't get fooled by sites about using infrared heat for injuries - BFST is a far better, far safer solution. If you came looking for a Sunbeam infrared heating pad you will be amazed at the difference. You get what you pay for. There are many reusable infrared heating pads on the market, but none are as good as BFST for relieving pain and keeping you safe. Reusable infrared hot packs that are heated in a microwave can be dangerous. They can burn the skin. BFST wraps don't have that danger. There is only one excellent Blood Flow wrap. The best heating pad is the BFST wrap.